It’s not uncommon for clients to email and ask me for advice on clothing for their session. Clothing choice is incredibly important to the feel of the final images so it’s lovely to hear from parents who want to take the time to get the clothing just right. For the purpose of this blog post I’m going to break down how to choose clothing into 3 categories. How to choose colours. How to choose the garments and accessories. How to coordinate. 1. How to choose colours. The first thing you need to consider when selecting clothing for your session is which colours will work best. I would suggest that you pick a number of colours which compliment the environment for your location and gather all of your clothing which fits this colour scheme. There’s a great little online tool that can help you to choose complimentary colours- Coolers. If you head over to the coolers website (https://coolors.co), click on the colour shown in the left hand column, and change it to match the overriding colour of your location (for example, for a summer session in woodland, this would be a dark green). You can then lock this colour in, and hit the space bar to change the remaining columns to complimentary colours. Keep going until you find a colour scheme that you like. Personally, I prefer colours which contrast the environment as they help to make you stand out from the background. 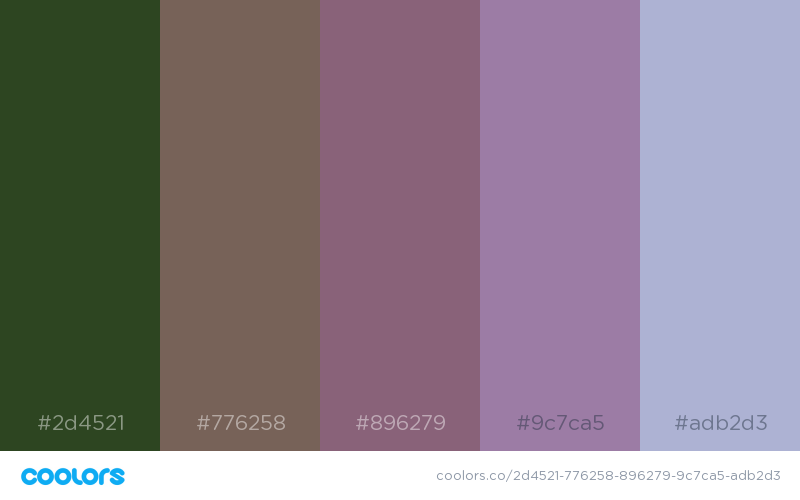 For the woodland example, my colour palette may look something like this. How to choose the actual clothes and accessories. OK, so you’ve developed a colour scheme, collected all of your clothes which fit the scheme and now need to choose which ones to wear. For me, this is the simple part – choose the ones you feel most comfortable in! These will be the ones that are most ‘you’. However, try to aim for plain, simple clothing that won’t distract where possible. The overall aim of the portrait is to focus on the person and not the fashion. 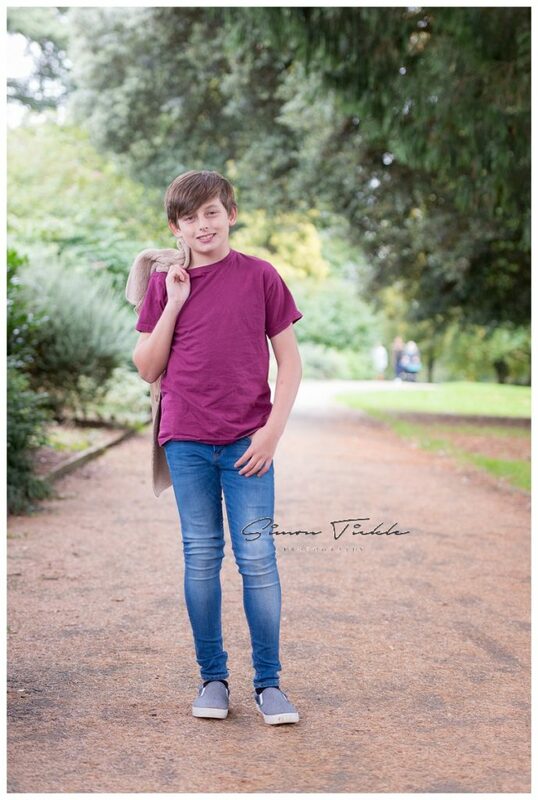 For Aaron’s session, he chose a light purple top and blue jeans. He also had a latte coloured Jacket. You can see how these clothes suit the background perfectly, but also allow Aaron to ‘pop’ from it. Gone are the days when the whole family would wear the same outfit. The images look far more natural if everyone wears what they’re comfortable in whilst at the same time coordinating. Each family member would select their preferred clothing that ties in with the bigger colour scheme. Using the above colours as a starting point, maybe Mum could wear a light purple blouse and Dad a Latte top for example. Play with the clothes. Lay them out on the floor next to each other. Try them on ahead of the session and see how you think they look. Why not take a phone snap wearing your chosen outfits and send it across to me. I’d be happy to give you some feedback. Here’s an example of how the colour chart and clothing may compliment each other for an autumn time session. So, there you have it. Hopefully you now have a good starting point on selecting the best clothing for your session. Are you still not sure or would like some more guidance? No problem! Just drop me an email or give me a call and I’ll help in any way I can.